Is this the ultimate 27in gaming monitor? The Acer Predator XB271HU is the big rival to Asus’s ROG Swift PG279Q. Both 27in monitors feature 165Hz IPS panels, have a G-Sync processor and have a host of premium features. All of which adds up to make them pretty much the two best gaming monitors you can buy right now. But which is the one to get? Well, as hinted at in my review of the Asus, one area where the Acer maybe doesn’t quite match its rival is in design. Both monitors have fairly striking gamer-oriented styling but Acer’s red metal feet and predator logo are just a bit much. It is a close run thing though, and overall both are great looking displays. Similarly the Asus maybe has the edge when it comes to its stand and base. The Acer largely has smooth movements for the various ergonomic adjustments it offers, but they’re just not quite as nice, and the base while largely pretty sturdy, isn’t quite so steady as the Asus. This is also reflected in the physical setup of the monitor. The Acer is really awkward to get out of its box, plus it then requires a fair bit of assembly, with the base attachment in particular being rather fiddly. Thankfully the panel just clips into place. Plus there’s a VESA mount for use with other monitor mounts. The Asus meanwhile arrives fully assembled and ready to go. One area where the Acer trumps the Asus is when it comes to its bezels. It has just a tiny sliver of plastic protecting the edge of the screen, with the rest of the bezel hidden below the display’s front pane of plastic. As a result, when the screen’s off the bezel almost completely disappears, giving the monitor a really slim and sleek look. The ROG Swift, while it has narrow and low profile bezels, has them sit on the front of the panel. Another victory for the Acer is that it boasts two more USB 3.0 ports than the Asus, with two on the back and two conveniently sat on the left edge. Otherwise connectivity is just as limited as on the Asus, thanks to the limitations of the G-Sync processor. You get just one DisplayPort and one HDMI. 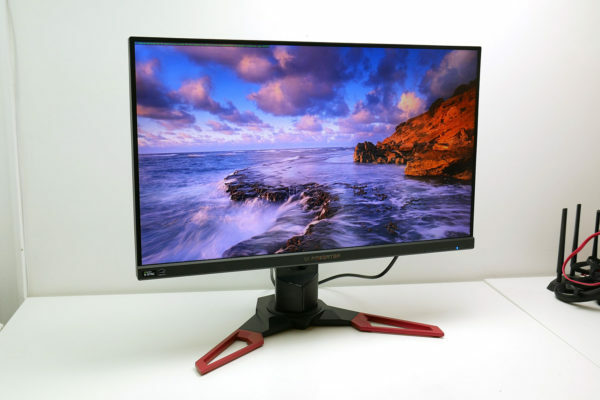 In contrast Freesync monitors often come with several more options. Also included is a headphone jack, plus there’s a pair of speakers inside. They’re nothing special but are always useful to have. I also much prefer that the Acer has an internal power supply, so there’s no power brick to have to hide away, unlike with the Swift. One area where this display really doesn’t impress, though, is the OSD. It has everything you should need and the buttons are perfectly responsive but it’s not the most intuitive layout. It’s a far cry from the lightning quick and easy experience on the Asus. So if it’s all a bit back and forth when it comes to the extras, is it image quality where these two can be separated? Er. No. Both displays, which use the same panel, are fantastic right out of the box, delivering accurate colours, high contrast and of course the excellent viewing angles you’d expect of an IPS screen. The Asus can go slightly brighter than the Acer but I’d never recommend using these monitors at maximum brightness anyway, and in every other regard this monitor is ever so slightly better. So good is this display, in fact, that there’s almost no need to calibrate it at all. Just drop the brightness down and away you go. Nonetheless, I did do a full calibration and sure enough everything improved a little. Uniformity is also very good, with hardly any discernible variation in the consistency of the image. As for IPS glow, it’s not really noticeable when viewed on axis. Off axis the glow is obvious but that’s simply the trade off of IPS displays. Put simply, this is about as good a display as you need for home computing. By all means there are non-gaming IPS screens with better image quality but only professionals really need much better. It’s a similar story for gaming. The combination of G-Sync and that 165Hz refresh rate is fantastic. There’s no ghosting or other artefacts, just great quality images delivered as quickly as your graphics card can produce them. So in the end, which is best? Well, if you’re on a slightly tighter budget the Acer is around £100 cheaper so it’s the clear choice. If you’re happy to spend a little more, though, then the Asus’ slightly nicer stand design and far superior OSD controls go some way to justify the extra money. It’s definitely a close call though.